LOCATION.--Lat 39°53'06", long 74°30'19" referenced to North American Datum of 1983, Woodland Township, Burlington County, NJ, Hydrologic Unit 02040202, on right bank, 25 ft upstream from culvert on Butterworth Road in Brendan T. Byrne State Forest, 3.4 mi upstream from confluence with Cooper Branch, and 7.0 mi southeast of Browns Mills. PERIOD OF RECORD.--Continuous-record discharge station, October 1953 to current year. Prior to October 1962, published as "McDonald Branch in Lebanon State Forest". October 1962 through September 2003, published as "McDonalds Branch in Lebanon State Forest". GAGE.--Water-stage recorder with telemetry and concrete control. 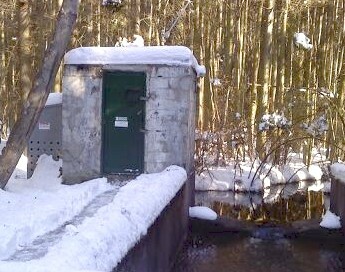 Datum of gage is 117.73 ft above NGVD of 1929 (levels from New Jersey Geological Survey benchmark). REMARKS.--Records fair, except for estimated discharges, which are poor. EXTREMES FOR PERIOD OF RECORD.--Maximum discharge, 61 ft3/s, Aug 28, 2011, gage height, 2.54 ft; minimum discharge, 0.49 ft3/s, many days. Water years 1963-96, 1998 to current year. Dissolved Oxygen: August 1984 to September 1992, September 2000.
pH: October 1981 to March 1982, May 1984 to September 1992, September 2000. Specific Conductance: December 1968 to September 1992, September 2000. Water Temperature: October 1960 to September 1992, September 2000, February 2012 to current year. REMARKS.--Discrete water-quality data were collected as part of the New Jersey Ambient Surface-Water-Quality Monitoring Network and the Hydrologic Bench Network (HBN).